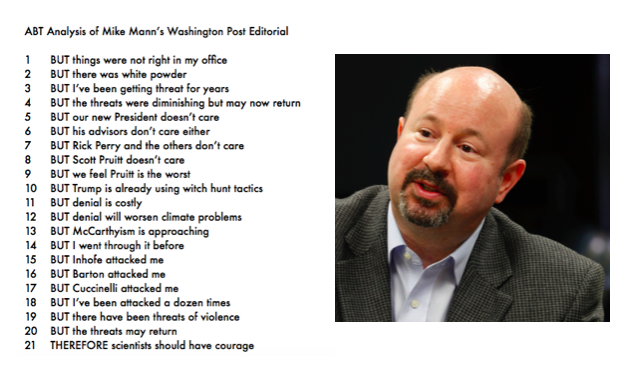 #73) The ABT Analysis of Mike Mann’s Washington Post Climate Editorial: Where’s the THEREFORE? I know we’re supposed to applaud climate scientists who speak out in defense of climate science, and I do. But just getting media attention isn’t the challenge — it needs to have long term impact. Which is where narrative dynamics come in. I offer up this ABT analysis of climate scientist Mike Mann’s editorial yesterday in the Washington Post to help demonstrate the importance and power of narrative structure. Yes, presenting lots of conflict draws attention for the short term, but for the long run, if you don’t have good narrative structure (i.e. all 3 of the ABT elements), you’re producing nothing more than “a sundry lists of facts.” Which is what he did — all B, no A or T.
THE ABT ANALYSIS OF MIKE MANN’S CLIMATE EDITORIAL in yesterday’s Washington Post. Climate scientist Mike Mann and I have been buddies since he was on the post-screening panel for my climate mockumentary “Sizzle: A Global Warming Comedy” at Penn State in 2009. One of my first interviews for my blog The Benshi was with him in 2010. He’s done a mountain of important work for the climate community, and borne the brunt of relentless personal attacks from climate skeptics — much of which he itemized in his Washington Post editorial yesterday. This is the hard part of narrative. There’s more to delivering content that will “stick” (and btw, “Made to Stick” was nothing more than the fact that things stick when they have good narrative structure) than just making a list. This is what participants in Story Circles Narrative Training begin to realize. The ABT is the magic bullet of communication which seems at first to be incredibly simple, but if you commit to actual in-depth training you begin to realize it has infinite complexity. And you begin to realize why it has been the central structuring principle of communication since pretty much the beginning of communication, thousands of years ago. As my buddy Park Howell (host of “The Business of Story” podcast) loves to point out — the ABT goes all the way back to cave people muttering, “Unh Hunh” (A), “Uh Oh” (B) and “Ah Ha!” (T). It is that primal. Okay, calm down, that’s not an insult, just a reference to the line from my hero James Carville (a master of simple communication) who coined the expression, “It’s the economy, stupid.” This is the message to the climate crowd — it’s time to focus on the “THEREFORE” of your messaging. It could have and should have been much more. One of the key realizations we’ve had in Story Circles is that “the quicker you can get through the A and the B, the more we’re willing to let you have all day with the T.” It’s the T that everyone really wants. But also, without some attention to the A, there is little overall context, importance and depth to the message being delivered. Yes, it’s nice to hook the reader with a first moment of conflict, but once that’s achieved it’s time to go to work on the basic narrative process starting with exposition. His editorial never did that. If you find yourself getting furious at me for having the audacity to critique someone on the climate team then you’re probably as much of the problem as the climate skeptics. It’s the same with the Democratic party which has delivered a colossal failure to this nation. It’s a time for rational, analytical (not arm waving) analysis of what happened, why, and then delivery of the THEREFORE (how to do better). Mann’s editorial should have given a couple of quick words of A (climate skeptics undermine the serious work that needs to be done, time is running out), a quick statement of the B (3 of his worst experiences plus all the signs that it’s now about to get really bad). That should have been about 4 paragraphs. The rest should have been the THEREFORE. As in, “Therefore it’s time to begin preparing for the assault on climate science we know will come.” It’s time to assemble defense strategies. It’s time to look back to 2009 and realize how unprepared the climate community was for the email attacks of Climategate. It’s time to shift the focus of science organizations from PUBLIC UNDERSTANDING (I served on the AAAS committee charged with this) to PUBLIC PERCEPTION of science. This last one is big, and is very difficult for scientists to accept. There is about to be a hell storm of attacks on the credibility of the entire science community. David H. Freedman’s excellent 2010 book, “Wrong: Why Experts Keep Failing US” pretty much foretold that eventually the problem of “fake news” (which is no different from “false positives”) would emerge. The door is now wide open for major communications chaos for science. I saw it four years ago in my local California community where there was a painfully divisive local environmental issue. The anti-science forces wrote editorials in our local newspapers saying, verbatim, that today “scientists are no different from lawyers — you can buy one to argue whichever side of an issue you want.” That, of course, is not true, but you better get ready for this at the national level. It’s coming. Last week I had dinner with the head of the largest science organization in the world. I detected no major preparations in progress for the coming onslaught. The bottom line, it’s time for a lot of THEREFORE’ing about the climate skeptic/anti-science community. But I don’t see it happening. At all. All I’m seeing coming is a whole lot of the same old Climategate “Well, that just isn’t fair” reactions.